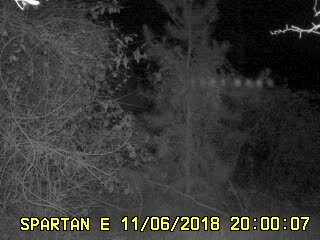 I have a strange image on a night time video from a Spartan camera. The photo attached is a still image of a 10 second video that shows a line of 8 lighted objects moving up and down and left and right in unison. I am thinking this must be some type of inherent camera issue rather than some physical object floating around in the forest. Has anyone here ever seen an image like this before? Looks like a reflection from a bank of L.E.D.s. What does the face of the Spartan look like?